The fast, easy & effective way to get booked. Screenshots of the actual web app. Create any type of event, add it to any time slot on your calendar and share with clients to get booked. Create, duplicate, save & easily reuse custom event types. The Time Slot Wizard makes it easy to add new time slots. Pick the event, location, day(s) and time(s) and click "add to calendar". Manage your time slots, view bookings, cancel bookings and filter slots by: all, fully booked, partially booked, no bookings and previous. Customers upload videos for review. Reply with a video from your library or add a custom video message. Set event types or specific time slots as "private" and they become only available to book using a direct link shared by the pro. Easily share access to your time slots via email, text or copy a link to post on social or anywhere else you want. You can also embed a list of your time slots into a website. This is how the actual booking process works for both customers and pro's self-booking. Also lead into auto-booking and payment options and payment updating. Customers set up instant slot bookings based on certain event types, days of the week and times for their favorite pros. New booking and upcoming slot reminders. Sent to you & your customers. Create custom packages that clients can purchase and towards booking of specific event types you select. Recurring options also available. Cash, club credit or credit cards online. Manage & market to your customers. View slot history, total revenue, payment status & days since previous booking. Create custom lists of previously booked customers. Next, easily share or book an entire list with one click. Good for classes, teams and other group types. Instantly turn off your bookings for the day or indefinite. Advertise your available time slots on any website with our "embed slots" feature. Need to manage other pro's time slot accounts? With our business features, you can manage up to 50 other pros on Time Slot Pro, using a single central dashboard and access to each pro's account. The app has multiple language versions. Currently available are English and Spanish. 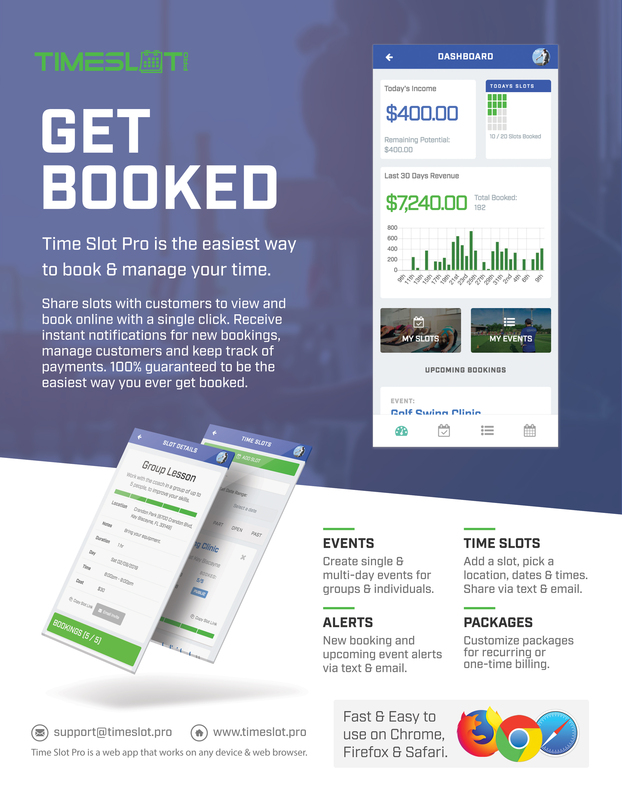 why pick time slot pro? Here is exactly why time slot could be the perfect time booking app for you. Save over 30% when you pay for the year. Get started with the basic features for free. The perfect account for an individual Pro. The perfect account for a small Pro team manager. The perfect account a larger Pro team manager. Enterprise accounts are available with private label hosting. Please ​contact our customer support team to discuss. Ask a question or request support. Tips on how to improve time management and time booking. Why Should Time Management Be Important to You? Read more from our Time Slot blog. Click here.